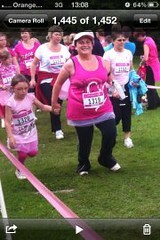 Sunday- Mummy and Rebecca Race for Life! 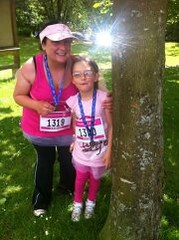 Sunday was the day that Rebecca and I “Raced for Life!” at Scolton Manor. I have taken part every year but it was Rebecca’s debut! I was not sure how she would be: worried about crowds/mud, slow/fast, tired/thirsty etc. But she was fine…and she loved it! It was muddy in places as to be expected and she did insist we walked through the really slippery parts, but whenever there was a good, dry surface, she was off! She didn’t moan and we chatted happily the whole way around. The five kilometres felt shorter than usual with her keeping me company…although it took a lot longer! We have raised over £75 so far online and collecting sponsors. You can still sponsor us here if you wish. The atmosphere is amazing at Race for Life! I cry during the minutes silence as we think of those we have lost and who are currently fighting cancer. I smile at the survivors now running to help others. I love reading everyone’s messages on their backs. You chat happily to different people along the way as they gradually drift into the same rhythm as each other. This year I ran in memory of my Dad, David, on Father’s Day and in memory of our friend who we lost this year, Dave. I also ran in support of my Aunty Janet and my friend, Alan who are currently having treatment for their cancer. I run for everyone who has been affected by cancer. Did you Race for Life this year? Previous Post Saturday-you know it’s a good party when your shoe breaks during the Macarena!